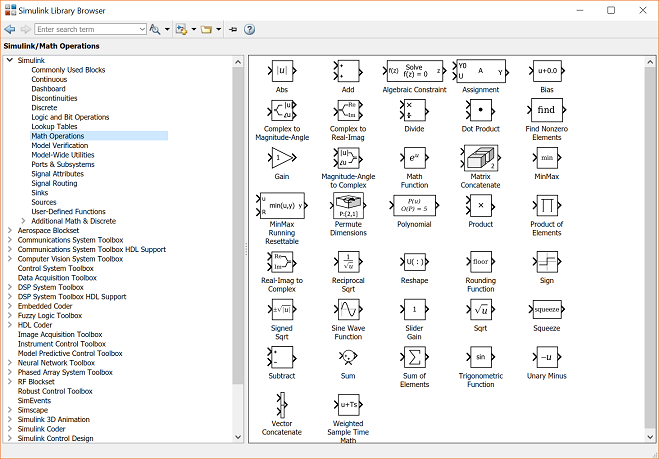 Each icon in the main Simulink window can be double clicked to bring up the corresponding block library. Blocks in each library can then be dragged into a model window to build a model. Commonly Used Blocks are used to list a lot of blocks which are usually used. 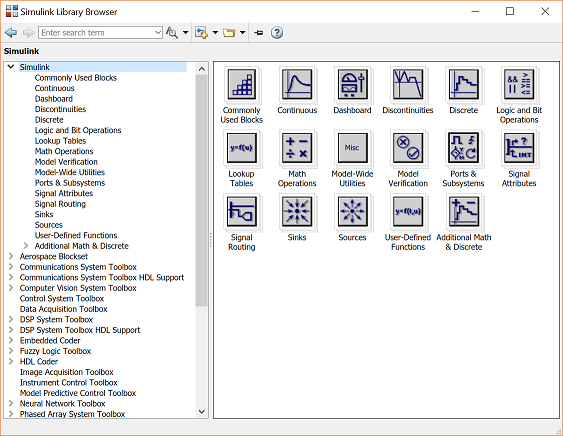 Double-click on the Commonly Used Blocks icon in the main Simulink window to bring up the Commonly Used window. The Bus Creator block combines a set of signals into a bus. The Bus Selector block outputs a specified subset of the elements of the bus at its input. The block can output the specified elements as separate signals or as a new bus. The Constant block generates a real or complex constant value. The constant output value is displayed in the middle of the block, with a default value of 1. 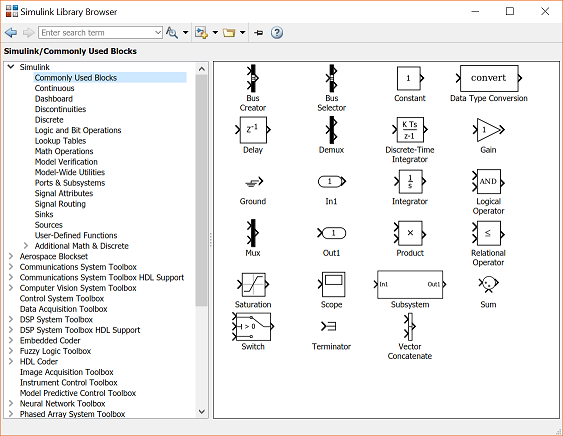 In order to examine these blocks, create a new model window (select New from the File menu in the Simulink window or hit Ctrl+N). To use this block, drag it from the Commonly Used Blocks window into your new model window. To change the constant output value, double-click on the block in your model window to bring up the following dialog box. Change the constant value field from 1 to some other value, say, 5, and close the dialog box. Your model window will reflect the update by displaying a 5 in the middle of the constant block. 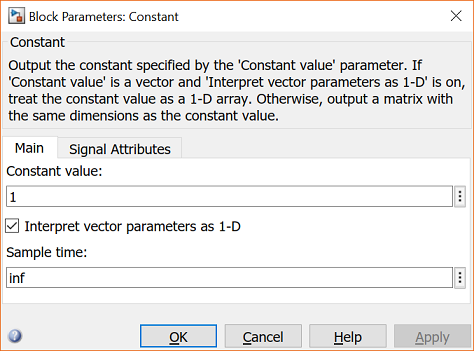 The Data Type Conversion block converts an input signal of any Simulink data type to the data type you specify for the Output data type parameter. The input can be any real- or complex-valued signal. The Delay block delays an input u according to the Delay length parameter, which you specify on the dialog box, or a delay length that a signal supplies to the input port. This block is equivalent to the z-1 discrete-time operator. The Mux (Multiplexer) block is used to combine two or more scalar signals into a single vector signal. Similarly, a Demux (Demultiplexer) block breaks a vector signal into scalar signal components. The number of vector components must be specified in each case. For an example of the use of a Mux block see the Bus Suspension Modeling in Simulink example. This is the discrete time approximation of a continuous-time integrator. The approximation method can be specified as well as the initial condition and saturation limits. The Gain block multiplies the input by a constant value (gain). The input and the gain can each be a scalar, vector, or matrix. The Ground block connects to blocks whose input ports do not connect to other blocks. Inport blocks are the links from outside a system into the system. The output of the Integrator is the integral of the input. An initial condition can be specified, as well as saturation limits. This block is very useful for modeling systems in Simulink. Outport blocks are the links from a system to a destination outside the system. By default, the Product block outputs the result of multiplying two inputs: two scalars, a scalar and a nonscalar, or two nonscalars that have the same dimensions. By default, the Relational Operator block compares two inputs using the Relational operator parameter that you specify. The first input corresponds to the top input port and the second input to the bottom input port. The Saturation block imposes upper and lower limits on an input signal. The Scope block displays inputs signals with respect to simulation time. A Subsystem block represents a subsystem of the system that contains it. The Subsystem block can represent a virtual subsystem or a nonvirtual subsystem. The Sum block performs addition or subtraction on its inputs. This block can add or subtract scalar, vector, or matrix inputs. It can also collapse the elements of a signal. The Switch block passes through the first input or the third input based on the value of the second input. The first and third inputs are called data inputs. The second input is called the control input. Use the Terminator block to cap blocks whose output ports do not connect to other blocks. The Concatenate block concatenates the signals at its inputs to create an output signal whose elements reside in contiguous locations in memory. Continuous Blocks are elements of continuous-time dynamic systems. 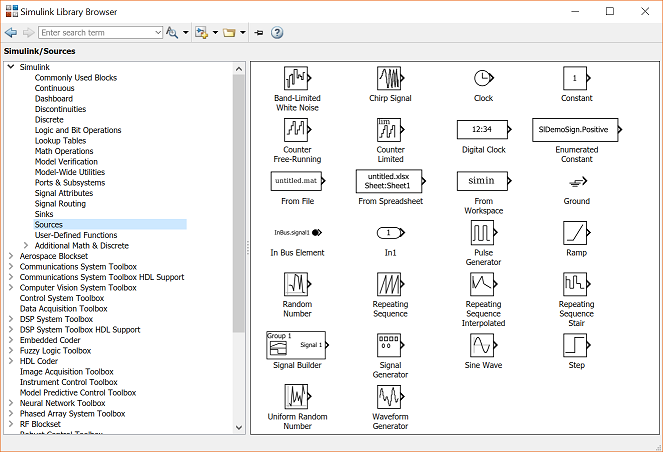 Double-click on the Continuous icon in the main Simulink window to bring up the Continuous window. The output is equal to the derivative of the input. The Integrator Limited block is identical to the Integrator block with the exception that the output of the block is limited based on the upper and lower saturation limits. The PID Controller block output is a weighted sum of the input signal, the integral of the input signal, and the derivative of the input signal. The weights are the proportional, integral, and derivative gain parameters. The PID Controller (2DOF) block generates an output signal based on the difference between a reference signal and a measured system output. A, B, C, and D matrices can be specified to create a LTI state space system. Inputs and outputs may be vector signals depending on the sizes of the matrices. Numerator and denominator polynomials can be specified to create a standard SISO LTI system transfer function. The Transport Delay block delays the input by a specified amount of time. You can use this block to simulate a time delay. The input to this block should be a continuous signal. 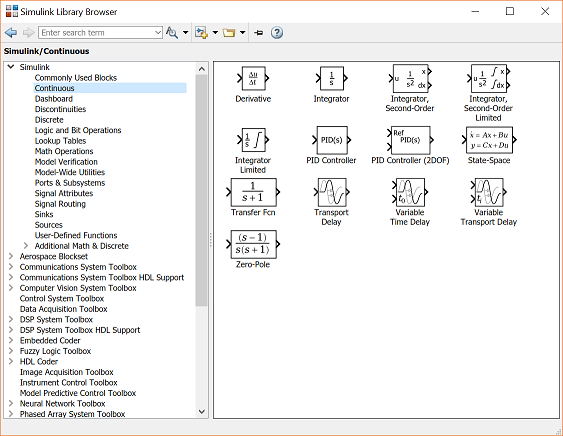 The Variable Transport Delay and Variable Time Delay appear as two blocks in the Simulink block library. 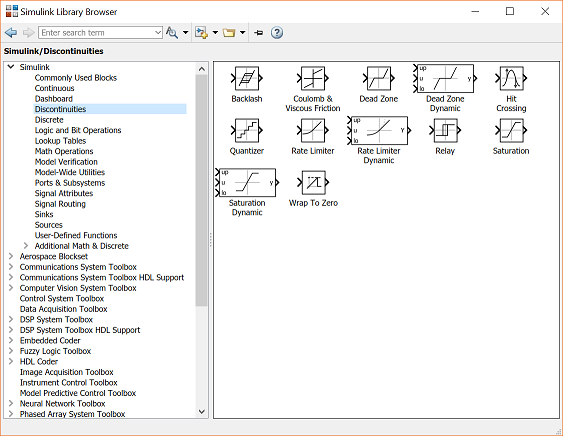 However, they are the same Simulink block with different settings of a Select delay type parameter. Use this parameter to specify the mode in which the block operates. The Zero-Pole block models a system that you define with the zeros, poles, and gain of a Laplace-domain transfer function. This block can model single-input single output (SISO) and single-input multiple-output (SIMO) systems. Discontinuities Blocks are elements of discontinuous-time dynamic systems. Most of these have special-purpose applications and will not be used in the tutorials. Only the most relevant Discontinuities blocks will be discussed here. 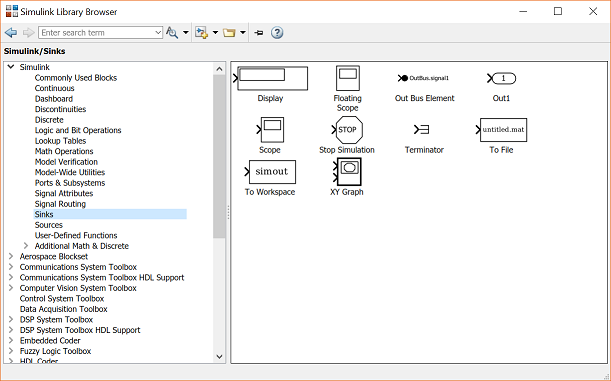 Double-click on the Discontinuities icon in the main Simulink window to bring up the Discontinuities window. The Backlash block implements a system in which a change in input causes an equal change in output. . However, when the input changes direction, an initial change in input has no effect on the output. The Coulomb and Viscous Friction block models Coulomb (static) and viscous (dynamic) friction. The block models a discontinuity at zero and a linear gain otherwise. The Dead Zone block generates zero output within a specified region, called its dead zone. The Dead Zone Dynamic block dynamically bounds the range of the input signal, providing a region of zero output. The Quantizer block passes its input signal through a stair-step function so that many neighboring points on the input axis are mapped to one point on the output axis. The Rate Limiter Dynamic block limits the rising and falling rates of the signal. The Relay block allows its output to switch between two specified values. When the relay is on, it remains on until the input drops below the value of the Switch off point parameter. When the relay is off, it remains off until the input exceeds the value of the Switch on point parameter. The block accepts one input and generates one output. The Saturation Dynamic block bounds the range of an input signal to upper and lower saturation values. The Wrap To Zero block sets the output to zero when the input is above the Threshold value. However, the block outputs the input when the input is less than or equal to the Threshold. Discrete Blocks are elements of discrete time dynamic systems. 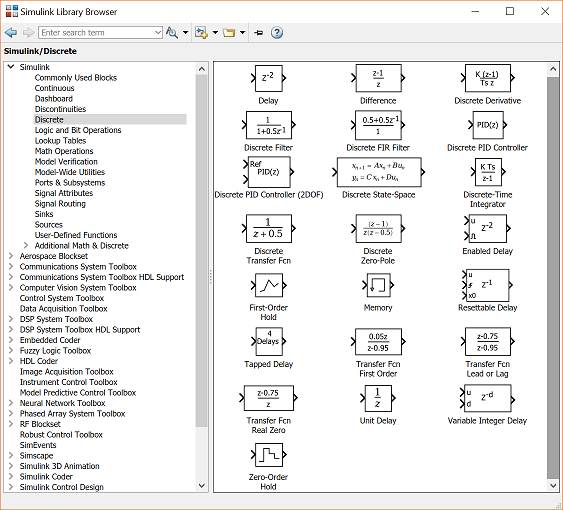 Double-click on the Discrete icon in the main Simulink window to bring up the Discrete window. The Unit Delay block holds and delays its input by the sample period you specify. The Difference block outputs the current input value minus the previous input value. The Discrete Derivative block computes an optionally scaled discrete time derivative. This is a discrete-time filter in rational function form. Vectors containing coefficients of the polynomials in z^-1 are specified. The Discrete FIR Filter block independently filters each channel of the input signal with the specified digital FIR filter. The block can implement static filters with fixed coefficients, as well as time-varying filters with coefficients that change over time. The Discrete PID Controller block output is a weighted sum of the input signal, the discrete-time integral of the input signal, and the discrete-time derivative of the input signal. The weights are the proportional, integral, and derivative gain parameters. The Discrete PID Controller (2DOF) block generates an output signal based on the difference between a reference signal and a measured system output. This is a discrete-time dynamic system in state-space form. A, B, C, and D matrices can be specified, as well as initial conditions. The output of this block is the discrete-time integration of the input signal. The integration methods can be Forward Euler, Backward Euler, etc. This is the standard form of a SISO LTI discrete time system. The transfer function polynomials are represented as coefficient vectors in terms of z. A discrete-time transfer function can be represented as list of z-plane poles and zeros. The gain can also be specified. This block delays the input signal by a specified number of samples. The block is considered enabled when the input to the enable port is nonzero, and is disabled when the input is 0. The First-Order Hold block implements a first-order sample-and-hold that operates at the specified sampling interval. This block has little value in practical applications and is included primarily for academic purposes. The Memory block holds and delays its input by one integration time step. This block accepts and outputs continuous signals. The block accepts one input and generates one output. Each signal can be scalar or vector. The Resettable Delay block delays the input signal by a variable sample period and resets with external signal. The Tapped Delay block delays an input by the specified number of sample periods and outputs all the delayed versions. Use this block to discretize a signal in time or resample a signal at a different rate. The Transfer Fcn First Order block implements a discrete-time first order transfer function of the input. The transfer function has a unity DC gain. The Transfer Fcn Lead or Lag block implements a discrete-time lead or lag compensator of the input. The instantaneous gain of the compensator is one, and the DC gain is equal to (1-z)/(1-p), where z is the zero and p is the pole of the compensator. The Transfer Fcn Real Zero block implements a discrete-time transfer function that has a real zero and effectively no pole. The Variable Integer Delay block delays the input signal by a variable sample period. The Zero-Order Hold block holds its input for the sample period you specify. The block accepts one input and generates one output. Each signal can be scalar or vector. Logic and Bit Operations Blocks are used to perform logic and bit operations. 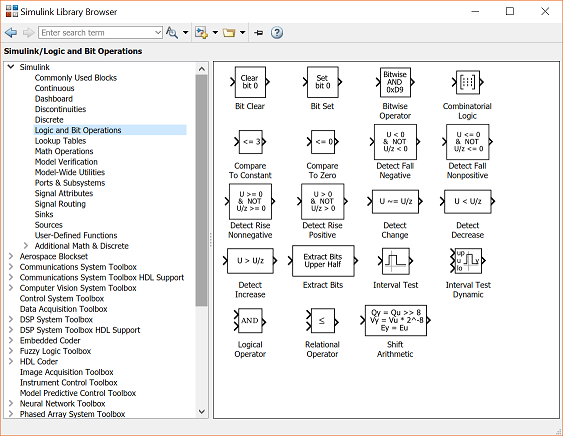 Double-click on the Logic and Bit Operations icon in the main Simulink window to bring up the Logic and Bit Operations window. The Bit Clear block sets the specified bit, given by its index, of the stored integer to zero. The Bit Set block sets the specified bit of the stored integer to one. The Bitwise Operator block performs the bitwise operation that you specify on one or more operands. The Combinatorial Logic block implements a standard truth table for modeling programmable logic arrays (PLAs), logic circuits, decision tables, and other Boolean expressions. The Compare To Constant block compares an input signal to a constant. The Compare To Zero block compares an input signal to zero. The Detect Change block determines if an input does not equal its previous value. The Detect Decrease block determines if an input is strictly less than its previous value. The Detect Fall Negative block determines if the input is less than zero, and its previous value was greater than or equal to zero. The Detect Fall Nonpositive block determines if the input is less than or equal to zero, and its previous value was greater than zero. The Detect Increase block determines if an input is strictly greater than its previous value. The Detect Rise Nonnegative block determines if the input is greater than or equal to zero, and its previous value was less than zero. The Detect Rise Positive block determines if the input is strictly positive, and its previous value was nonpositive. The Extract Bits block allows you to output a contiguous selection of bits from the stored integer value of the input signal. The Interval Test block outputs TRUE if the input is between the values specified by the Lower limit and Upper limit parameters. The Interval Test Dynamic block outputs TRUE if the input is between the values of the external signals up and lo. The block outputs FALSE if the input is outside those values. The output of the block when the input is equal to the signal up or the signal lo is determined by whether the boxes next to Interval closed on left and Interval closed on right are selected in the dialog box. The Logical Operator block performs the specified logical operation on its inputs. The Relational Operator block compares two inputs using the Relational Operator parameter that you specify. The first input corresponds to the top input port and the second input to the bottom input port. Math Operations Blocks are used to Perform math operations. 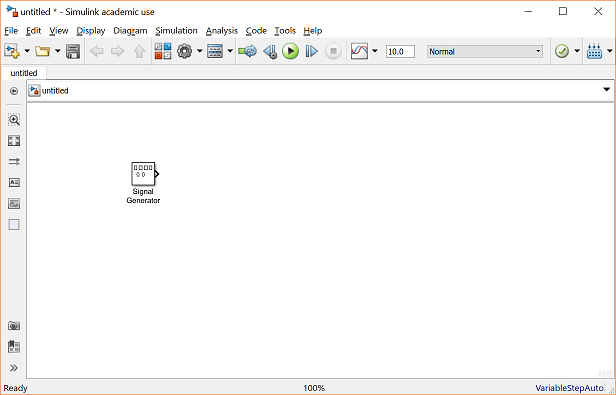 Double-click on the Math Operations icon in the main Simulink window to bring up the Math Operations window. The Algebraic Constraint block constrains the input signal f(z) to zero and outputs an algebraic state z. The Assignment block assigns values to specified elements of the signal. where U is the block input and Y is the output. The Complex to Magnitude-Angle block accepts a complex-valued signal of type double or single. The Complex to Real-Imag block accepts a complex-valued signal of any data type that Simulink supports, including fixed-point data types. The Divide block outputs the result of dividing its first input by its second. The output is equal to the dot product of two vector signals. The Find block locates all nonzero elements of the input signal and returns the linear indices of those elements. The Magnitude-Angle to Complex block converts magnitude and phase angle inputs to a complex output. The MinMax block outputs either the minimum or the maximum element or elements of the inputs. The MinMax Running Resettable block outputs the minimum or maximum of all past inputs u. The block reorders the elements of the input signal so that they are in the order you specify in the Order parameter. You define a set of polynomial coefficients in the form that the MATLAB polyval command accepts. The block evaluates P(u) at each time step for the input u. The output is equal to the product of the inputs. The number of inputs can be specified. The Product of Elements block inputs one scalar, vector, or matrix. The Real-Imag to Complex block converts real and/or imaginary inputs to a complex-valued output signal. The Reciprocal Sqrt block gives the reciprocal of the square root of the input. The Reshape block changes the dimensionality of the input signal to a dimensionality that you specify, using the block's Output dimensionality parameter. The Rounding Function block applies a rounding function to the input signal to produce the output signal. The Signed Sqrt block gives the square root of the absolute value of the input, multiplied by the sign of the input. This block is the same as the Sine Wave block that appears in the Sources library. This multiplies the input by a scalar constant which is specified by moving a slider on the screen as shown below. The limits of the slider can be specified. The Sqrt block gives the square root of the input. The Squeeze block removes singleton dimensions from its multidimensional input signal. Sink Blocks are used to display or output signals. 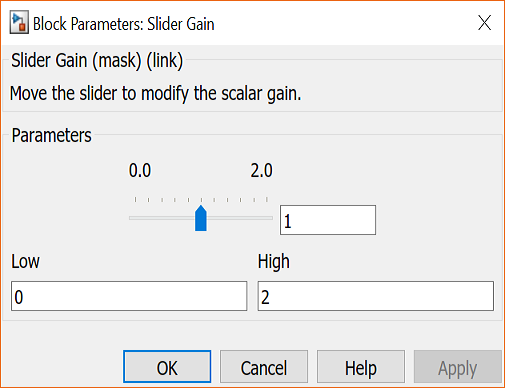 Double-click on the Sinks icon in the main Simulink window to bring up the Sinks window. Notice that all of the sink blocks have inputs and no outputs. Most have a single input. The Display Sink Block is a digital readout of a signal at the current simulation time. The Out Bus Element block specifies an element of a bus (or entire bus) for the output port of the subsystem. The Scope Sink Block was described earlier. It is used to display a signal as a function of time. This is a special control block which is triggered to stop the current simulation when its input is non-zero. The To File Sink Block saves a signal to a .mat file in the same way that the From File Source Block reads from a file. The sampling time can be specified, but is not necessary. The To Workspace Sink Block stores a signal in a specified workspace variable. Unlike the To File Sink Block, the time is not saved in the variable, and must be stored separately. The XY Graph Sink Block plots one signal against another. It is useful for phase-plane plots, etc. Source Blocks are used to generate signals. 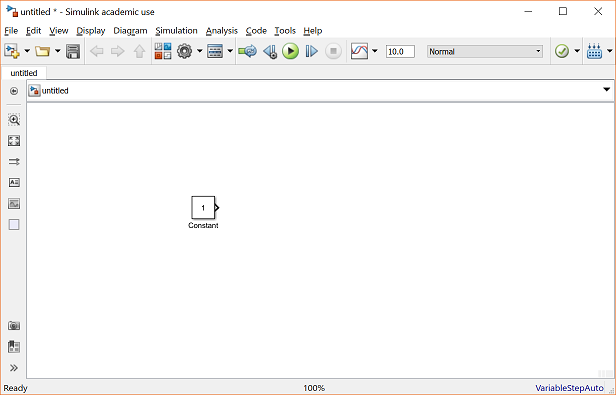 Double-click on the Sources icon in the main Simulink window to bring up the Sources window. Notice that all of the source blocks have a single output and no inputs. While parameters in each of these blocks in the library can be modified by double-clicking the block, it is best to not modify the blocks until they have been copied into a model window. 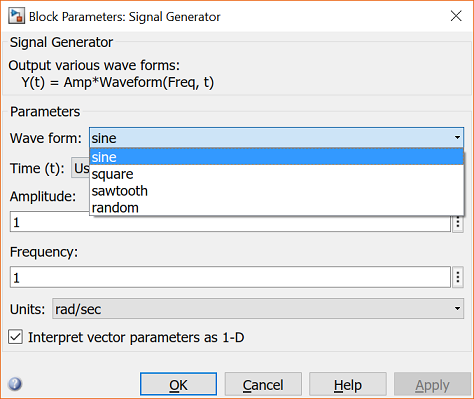 The Band-Limited White Noise Source Block generates a random signal which changes at a specified sample period. The strength of the signal and a random number seed can also be specified. The Chirp Signal Source Block generates a sinusoidal signal which scans over a range of frequencies. The initial and final frequencies as well as the scan time can be specified. The amplitude is always 1, and the chirp signal repeats itself after each frequency scan. The Clock Source Block generates a signal equal to the current time in the simulation. This is useful when the output of a simulation is exported to MATLAB but occurs at uneven time steps. The clock's output reflects the times at which the other signals outputs occur. , where Nbits is the number of bits. Then the counter overflows to zero and begins counting up again. The Counter Limited block counts up until the specified upper limit is reached. Then the counter wraps back to zero, and restarts counting up. The Digital Clock Source Block generates a strictly periodic time signal at a specified sampling interval. The Enumerated Constant block outputs a scalar, array, or matrix of enumerated values. The From File Source Block outputs a signal taken from a specified .mat file. A matrix saved in MATLAB as a .mat file will become a signal where the first row of the matrix specifies the time values. This is similar to the Repeating Sequence Source Block. The block reads data values from a spreadsheet. It interprets the first column as time and the first row and the remaining columns as signals. 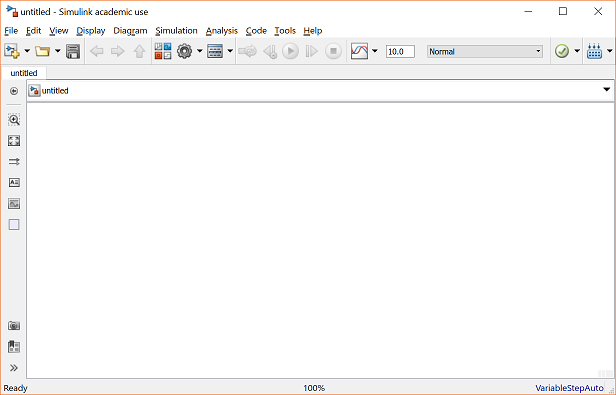 The From Workspace Source Block is identical to the From File Source Block except the values are taken from a variable (or expression) in the MATLAB Workspace. The block selects an element from a bus (or the entire bus) that is connected to the input port of the subsystem. The Pulse Generator Source Block generates a pulse train of varying duty cycle. The signal switches between 0 and the specified value starting at a particular time. The Period, Duty Cycle, Amplitude, and Start Time can be specified. The Ramp Source Block generates a signal which is initially constant and begins to increase (or decrease) at a constant rate at a specified time. The slope, start time, and initial output can be specified. The Random Number Source Block generates a sequence of random numbers generated with the specified random number seed. Because of the seed, the same sequence can be applied to more than one simulation. An arbitrary set of points (t,y) can be specified. These points are entered as a vector specifying the time values, and a vector specifying the corresponding output values at those times. The output is linearly interpolated between the specified time values. At the last time value, the output immediately starts over, possibly with a discontinuous transition. The Repeating Sequence Interpolated block outputs a discrete-time sequence and then repeats it. The Repeating Sequence Stair block outputs and repeats a stair sequence that you specify with the Vector of output values parameter. 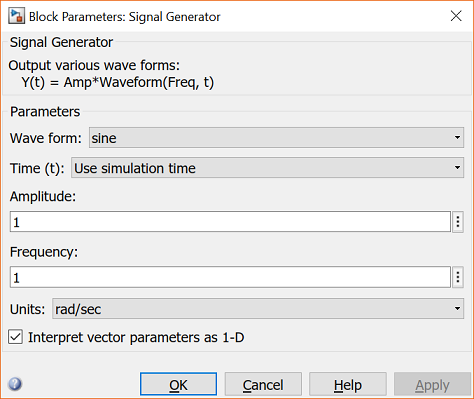 The Waveform Generator block outputs waveforms based on signal notations that are entered in the Waveform Definition table. The Signal Generator Source Block is a general-purpose source which encompasses some of the other blocks' functions. It generates periodic waveforms such as sine, square, and sawtooth waves as well as a random signal. Drag this block from the Sources window to your model window. By default, the Signal Generator generates a sine wave with an amplitude of 1 and a frequency of 1 Hz. To change this, double-click the Signal Generator in your model window to bring up the following dialog box. The Amplitude and Frequency can be changed in this dialog box, as well as the type of waveform. To change the waveform, click on the Waveform field to bring up a list of possible waveforms. The desired waveform can be selected from this list. The Sine Wave Source Block generates a sinusoidal signal. The Amplitude and Frequency can be specified, as well as the Phase (unlike the Signal Generator). There is a fourth parameter, the Sample Time, which can be used to force the Sine Wave Source to operate in discrete-time mode. As described earlier, the Step Source Block generates a step function. The initial and final values can be specified, as well as the step time. The Uniform Random Number block generates uniformly distributed random numbers over an interval that you specify.